* Check "This plug-in will make contributions to the UI"
* You get a list of templates which includes "Riena Hello World" and "Riena Mail Template"
Use these steps to set-up the Target Platform to use Riena. [Target Platform] is the set of plug-ins available at compile time. 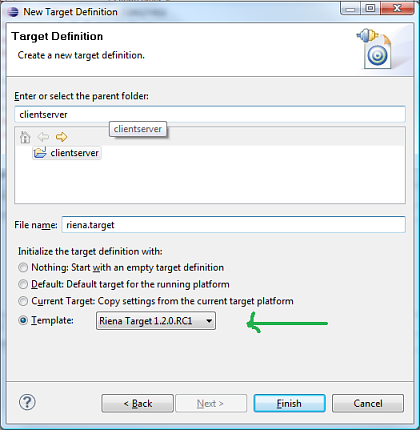 Create the Riena Target Definition (File > New > Other > Plug-in Development > Target Definition > Next. File Name: riena.target, Template: Riena Target 1.2.0.0. Finish). The Target Definition editor will open. Wait for the "Resolving Target Definition" job in the status bar (bottom left) to finish. Click on "Set as Target Platform". 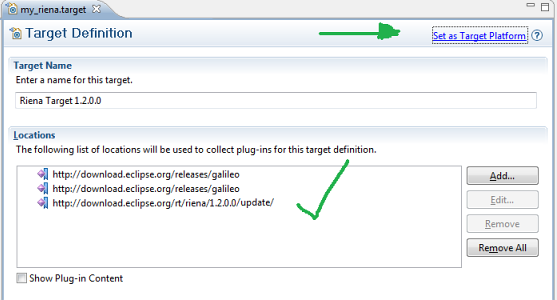 If you like to install Riena 1.1.0 from the Galileo Repository add Riena Core SDK and Riena SDK Samples. Check: "this plug-in will make contributions to the UI"
Select: "Yes" in "Would you like to create a rich client application?" 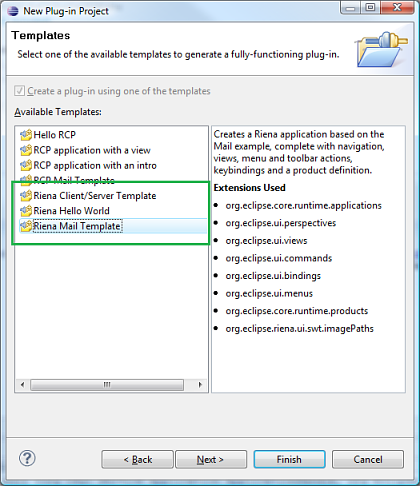 If you picked the "Riena Client/Server Template" use the launch configurations that are included in the project. Start the server first then the client. There are classes like AllTests on various level that you can run as Junit Plugin Tests. Sometimes when you launch a AllTests classes as JUnit Plugin Test for the first time you get a "Launch Error". Simply say "No" in the dialog and modify the launch entry in the dialog for this class in the tab "Main" change the field "Run an application" from "org.eclipse.ui.ide.workbench" which is the default to "[No Application] - Headless Mode"
Start Riena App Server from the Run Dialog (dont forget to press the button "add required bundles"
Also this server starts on 8080, make sure that port is not taken. In The Run Dialog -> Eclipse Application there are two entries "SWT ExampleApplication" and "SWT ExampleApplication (with alternative Lnf)".